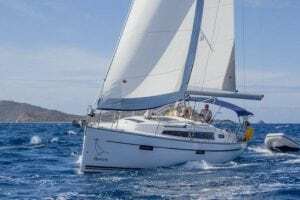 Looking To Form A BVI Flotilla? Are you considering chartering more than one yacht or catamaran to form a BVI Flotilla? If so, Horizon Yacht Charters will be delighted to assist and tailor your BVI flotilla fleet to the requirements of everyone sailing in the fleet. A BVI flotilla vacation provides an informal and relaxing way for families, friends couples and groups to enjoy a stunning sailing vacation together. It’s also ideal if you have several people who are inexperienced or non-sailors, and also if some members of your group are unfamiliar with the sailing grounds. If some members of your BVI Flotilla would prefer to relax even further, professional skippers are available from Horizon as well. A skipper will take care of all sailing the yacht. Horizon skippers also have excellent local knowledge allowing them to provide advice on the best locations to snorkel, scuba-dive, eat out and generally make the most of your sailing vacation. Here are some suggestions for your fleet composition when considering your most appropriate BVI Flotilla. The BVI sailing grounds are amongst the best in the world, with line-of-sight sailing everywhere. It is suitable for sailors at all levels of experience, but at Horizon we understand there may be some members of your party who may need to feel reassured. Catamarans are ideal for non-sailors and young families, with plenty of space and their very stable platform. If you’re considering two monohulls, we suggest you consider a mix of one monohull and one catamaran. This will provide you with more space on-board for socialising and swimming when on anchor. We can assist you with matching your yachts to the requirements of your group and ensure they have similar speeds and pointing capability, allowing you to remain close to each other when on passage. We recommend you contact us for larger flotillas, so we can advise on the most suitable fleet composition to meet your needs. Whatever your requirement for sailing in the beautiful British Virgin Islands, as local experts on BVI yacht charters, we are best-placed to advise you. Contact Horizon Yacht Charters in the BVI today to reserve your immaculate yachts for your BVI Flotilla.